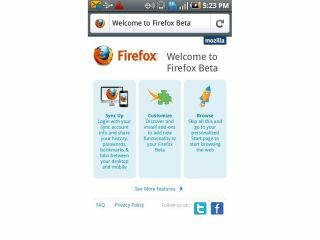 Mozilla has made available for the first time a beta version of its mobile browser for Android devices. Called, unsurprisingly, Firefox Beta, the new app shows off a version of Firefox 5 which is still in development. The beta offers a load of new features, including improved load speeds, better panning, improved compatibility with SwiftKey and a better display of images and video. Mozilla has also revealed that there are now over 150 add-ons for Firefox for mobile, with 100 of those compatible with the latest beat version of the app. This makes sense, considering Mozilla is using the same browsing engine as its desktop to power the mobile app. The new app also adds support for over six menu items in the Android Menu and images downloaded to the Android Gallery are now immediately visible. If you have an Android device running on Android 2.0 or higher, then you can go to the Android Market and download the app now.